This another step forward for the 3.9-mile Purple Line Extension project and puts the subway addition closer to construction. Utility relocations and some other prep work have are already underway. Three rail projects that are receiving Measure R funding are already under construction — the Crenshaw/LAX Line, the Expo Line Phase 2 and the Gold Line Foothill Extension. The Regional Connector is ramping up for construction after the awarding of a construction contract earlier this year. There will be more details on the Purple Line Extension contract later in the month when the staff report is released. The Metro Board is scheduled to consider the contract at its meeting later this month. The Los Angeles County Metropolitan Transportation Authority (Metro) staff today recommended awarding a $1.636 billion contract to design and build a 3.9-mile extension of the Metro Purple Line subway from Wilshire and Western to Wilshire and La Cienega to a joint venture composed of three of the world’s top construction companies. At its July 24 meeting the Metro Board will consider the recommendation to award a contract to the firms of Skanska, Traylor Bros. and J.F. Shea, a Joint Venture (STS). The Metro Board’s Construction Committee will first review staff’s recommendation on July 17. The procurement process has been extensive and altogether has taken nearly two years to reach the point where the Metro Board this month will consider a contract award for the first phase of the subway extension. The contract calls for building twin subway tunnels on a 3.92-mile alignment that includes three new underground stations at Wilshire/La Brea, Wilshire/Fairfax and Wilshire/La Cienega. It also includes train control and signals, communications, traction power supply and distribution, and fare collection systems that will be integrated with the existing Metro Rail system. Construction activities could begin later this year depending on when the contract is awarded. The contract requires completion in October 2024. The contractors have proposed an early completion schedule saving 300 calendar days. Combined, these three construction firms have more than 300 years of experience. Traylor Bros., Inc. has a track record that features more than 110 tunneling projects including the Metro Gold Line Eastside project that connects downtown Los Angeles with Boyle Heights and East Los Angeles. That project was completed in 2009 on time and within budget, and Traylor Bros. achieved 4.5 million work hours without incident and zero ground loss during construction. Skanska is building the extension of the Expo light rail project from Culver City to Santa Monica, scheduled to open in early 2016. The project is on time and within budget. The company also worked on the Metro Gold Line Foothill Extension from Pasadena to Azusa, also scheduled to open in 2016 and is on time and within budget. Skanska and Traylor Bros. are the team building the Regional Connector, a 1.9-mile underground light rail project in downtown Los Angeles that will connect the Metro Blue, Gold and Expo lines. Shea is part of a joint venture building the Crenshaw/LAX Transit Project, which will connect the Metro Expo and Green light rail lines in the Crenshaw and Inglewood corridors. Shea and Traylor worked on the large City of Los Angeles Northeast Interceptor Sewer tunnel. The firms’ experience in working together on large transit and other infrastructure projects was cited as a major strength in a recommendation for the subway contract by an evaluation panel that included representatives from Metro and the City of Los Angeles. The four panelists combined have about 100 years’ experience in construction, engineering and operations. Another plus for the STS team is its experience and skill in overseeing complex tunneling projects. The Purple Line subway extension will tunnel through tar sands and gassy soil conditions. Among other strengths cited was the consortium’s very good experience in executing mitigation measures that address third party and community concerns, and strong participation for small and disadvantaged businesses in subcontracting for design and construction (20.25 and 17 percent). Forty percent of the contract evaluation was based on price. STS was highest in this regard but scored higher in project management and technical approach than two other bidders – Westside Transit Partners WTP (Impregilo, S.p.A., Samsung E & C America Inc. and Salini USA Inc. and a bid by Dragados/Astaldi/Southland (DAS), a joint venture aka Dragados USA Inc. (DUSA), Astaldi Construction Corporation and Southland Contracting Inc.
Funding for this first phase of the subway extension to the Westside comes from federal grants and low-interest loans, monies from Measure R and the City of Los Angeles, and other existing local and federal funds. 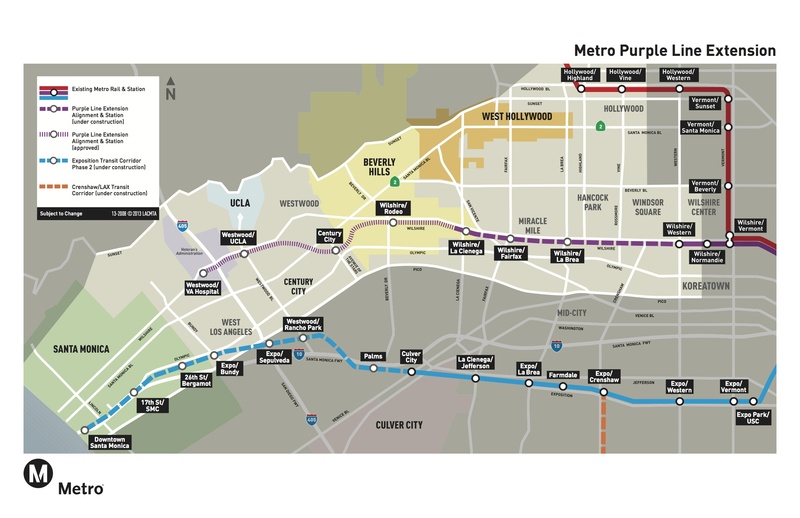 Two other construction phases entailing separate future design/build contracts eventually will extend the Purple Line subway westward for nearly nine miles to just past UCLA and the Veterans Administration Hospital in Westwood with a total of seven new stations. Metro is a multimodal transportation agency that is actually three companies in one: a major operator that transports about 1.5 million boarding passengers on an average weekday on a fleet of 2,000 clean air buses and six rail lines; a major construction agency that oversees many bus, rail, highway and other mobility-related building projects, and; the lead transportation planning and programming agency for Los Angeles County. Overseeing one of the largest works programs in America, Metro is, literally, changing the urban landscape of the Los Angeles region. Dozens of transit, highway and other mobility projects, largely funded by Measure R, are under construction or in the planning stages. These include five new rail lines, the I-5 widening and other major projects. Man, this is just taking way too long. Shouldn’t this be done like 20 years ago? So much layers of stupid bureaucracy and whining NIMBYs everywhere. I bet you there’s going to be more endless and stupid meetings and studies after this and the subway won’t be finished until the year 2200. It didn’t help that Los Angeles County voters in 1998 approved a ballot measure banning local sales taxes from being used to build a subway. A local funding source wasn’t found until 2008 when voters reversed course and approved Measure R that did provide local funding for the subway. FINALLY ! Let’s get building. 2024 is ridiculous as a completion date. It also doesn’t help that delays and cost overruns are also caused by special interest groups like Beverly Hills who are against the idea of a subway going underneath their prestigious school. And before Beverly Hills was Henry Waxman putting the project to a halt due to methane gas concerns near the La Brea Tar Pits (or whatever the BS reasons and kickbacks he was on to sponsor that federal bill). Anytime some new transit development or idea is planned out, someone somewhere is going to get mad about the proposals. Alas, that’s the price we pay for LA Metro being a LA County taxpayer subsidized government agency. Things like this don’t happen in places where mass transit is privatized, since no taxpayer funds are used, any projects and any revenue ideas have no need to ask for the public’s input which just leads to constant delays, endless meetings, studies, and overruns. The ignorance and naivety of comments that call for privatization as the panacea of all that is wrong with Metro is yet a glaring example of how perpetuating your own fantasy of how reality works is very different from what actually happens. A private company could do a cost benefit analysis and decide that a route will be so popular that they will use eminent domain and cut a path through homes, churches, Landmarks or whatever else is there; or the flipside could happen: a route would be so full of legal challenges or other pitfalls that it isn’t worth the cost of studying or planning and therefore nothing is done. A private company could make some drastic changes to fees charged to Metro users since they are a private company out to make maximum profit for themselves and their shareholders. Calls for privatization therefore blissfully ignore the possibility that nothing much could change or it could change for the worse and perhaps most ironically for those wanting a private company running Metro, special interests will still be around living, breathing and even kicking!!! The tired refrain of “but in Asia they do it” is a worthwhile reminder that yes they may do “somethings” differently but they do not have the same laws, history or culture that we do, therefore those who advocate for such a system are again ignoring some egregious flaws inside their own reasoning and living in their own myth of how the world operates. Instead of advocating for full scale reform, which will never happen, they would be better off learning how the system actually works and then work within that. Don’t mean to start a flame war. As long as the name “Tutor” is not anywhere near this project, it’s all good. One thing for sure is that if Metro acted more like a profit-oriented business, a lot of things would go much faster through investment in technology than the slowness of government bureaucracy that exists today at Metro. Firstly, we wouldn’t have waited 20 years to fix the honor system loophole. Metro was bleeding money and many fares went uncollected for the past 20 years of sky high fare evasion rates. They’ve continuously denied the problem until they were forced to research the matter and only then did they realize fare evasion rates were as high as 20%. Privatization, where profits and revenues are more important, would’ve looked at fixing that right from the start using the technology that’s available today. The fare gate systems that exist everywhere from San Francisco to London to Tokyo are all great investments that could’ve been installed right from the start. Secondly, we wouldn’t have to wait forever for the TAP website to be updated. Something like that would be done in less than a month under privatization than taking eight years to fix and making promises that they can’t keep (Metro promised an update by end of last year and nothing happened). We all know how much a clunker the TAP website is. It’s practically shameful that a website that’s built like a 1990s webpage even exists in that form in the age of SQL server applets, HTML5 and Java. Thirdly, TAP would be much more successful under privatization through common sense ideas as promoting TAP card usage more over cash payments. Ideas like making fares cheaper when paid through TAP would be used as an incentive to move more people over to TAP, benefiting everyone. Instead, Metro keeps trying to reinvent the wheel wasting people’s tax dollars. History and culture has nothing to do with it. The old P&E lines built by Henry Huntington were privately owned. For profit transit model is nothing unusual in the US, it has been operated in the past as a privately owned business without government support. Greyhound, Blot Bus, Peter Pan are all privately owned transportation companies. So are the old Santa Fe lines and other cross-country railroads when they were running passenger services pre-Amtrak. American Airlines, United Airlines, Delta Airlines, Southwest, Alaska Airlines, are examples of privately owned businesses offering transportation services by air. Taxi cab companies are also privately owned businesses. So are new upstarts like Lyft and Uber. You can cite that these examples offer different services, but the fact remains that private transportation services do exist in the US both in the past and the present in many forms, so citing excuses of the inability to run mass transit as in Asia is a desperate argument at best. Even if privatization may not be the answer, there’s a lot of things that Metro can learn on how to operate more like a successful business than a bloated government bureaucracy, and they can at least learn how to do that from Asian transit corporations. There are pros and cons to both for profit corporations and government run bureaucracies. I agree that Metro could stand to start thinking with at least a bit more business like mindset. Just as Josh Young stated above, Metro is at least ten or twenty years behind in utilizing technology to make operations more efficiently.